Doubles the number of quick slots for consumables and for bombs. 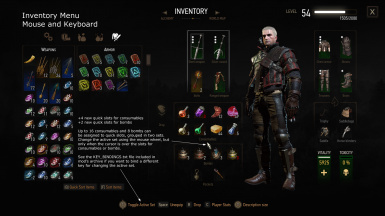 Provides a Quick Inventory from which you can drink potions or decoctions, apply oils, view and repair equipped items, eat food or read books. Updated the image displayed inside Quick Access menu. Now it looks like in vanilla game. 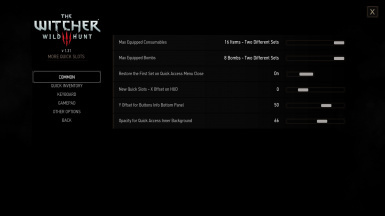 Added a black background inside Quick Access menu. The default opacity is set to 66% and is configurable (see the Common section from mod's settings menu), so it can be set fully transparent. 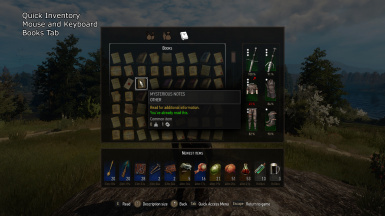 Fixed a minor bug regarding Quick Access menu: sometimes the image for equipped bolts was displayed even if the crossbow was not the highlighted slot. This bug exists in vanilla game. Added the possibility to select the maximum number of items that can be assigned to quick slots: 4 (vanilla), 8 (one set), 12 (two sets, but the first 4 items are the same) or 16 (two different sets). This means that the new quick slots for consumables can now be disabled. Added the possibility to toggle the active set when exploring or while in combat. Bug fix: the panel with newest items was displayed even if it was disabled from options menu. Updated for GOTY version 1.31. Bug fix: the items could not be repaired anymore from game's standard Inventory menu. Thanks to Fnts for reporting the issue. Added Russian translation. Thanks to DJ_Kovrik. Fixed another critical bug: input was not working after closing the Quick Inventory menu. 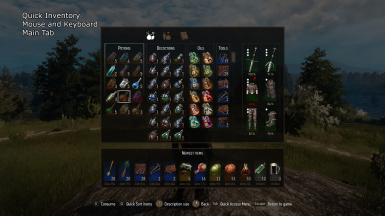 Added Quick Inventory HUD module. Added new settings to prevent applying oils and using repair tools while in combat. Added a menu with all mod's settings. 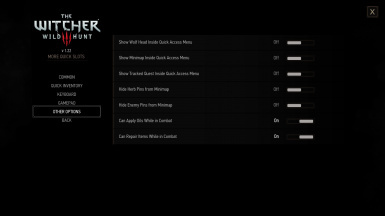 Added new settings to show the Wolf Head, minimap and currently tracked quest inside Quick Access menu. Added new settings to hide the herb and enemy icons from minimap. The first release for patch 1.22 had the NEW_POTION_QUICK_SLOTS_KEYS option set to PQSK_BindNewKeys, instead PQSK_HoldStdKey like specified in mod's description. Updated for game version 1.22. Fixed a small problem. The default key recommended for changing the active potions set is the LEFT SHIFT, but it is also used inside inventory menu for comparing items. Now the SHIFT key will show the additional data if there's a tooltip displayed for an item that can be compared with another, otherwise will change the active potions set. Added the possibility to assign up to 16 consumables and 8 bombs to quick slots. First release for patch 1.12. Doubles the number of quick slots for consumables (potions and food) and for bombs. Actually you can assign up to 16 consumables and all 8 bombs to quick slots because the equpped items are separated in two sets, only one being active at a time. 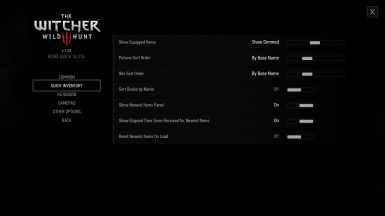 And you can easily toggle the active set from Inventory and Quick Access menus. 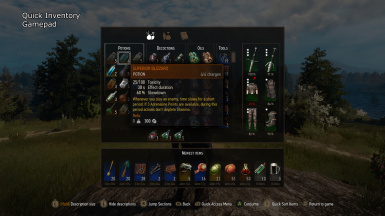 Note that by default the first set is restored back as the active one when the Inventory or Quick Access menu is closed, but this behavior can be easily changed from mod's options menu. 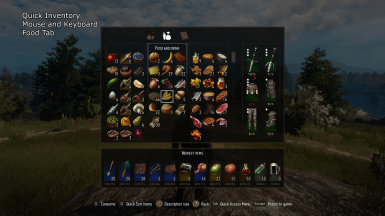 Another major feature is the Quick Inventory HUD module, from which the player can drink potions or decoctions, apply oils, view and repair equipped items, eat food or read books. Also the Quick Inventory contains a list with the latest 12 received items. This mod fully supports a gamepad as input device and was tested using an Xbox One Wireless Controller. See the screenshots for more details. All of them! a) If you use Unification Patch then download modMoreQuickSlots-1.31.3-UPatch.zip file. b) Otherwise if you have the GOTY version from GOG then use the modMoreQuickSlots-1.31.3-GOTY.zip file. c) Otherwise if you have the GOTY version from Steam then use modMoreQuickSlots-1.31.3-SteamGOTY.zip instead. d) Otherwise use modMoreQuickSlots-1.31.3.zip file. 1. 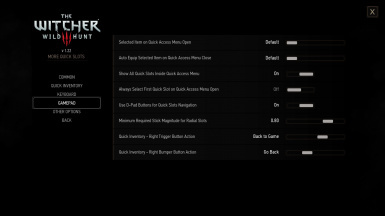 Install it like any other Witcher 3 mods. Compatible with Nexus Mod Manager. 2. 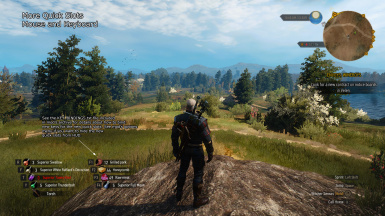 Copy the BIN folder from mod's installation directory or from downloaded archive to Witcher 3 installation directory. This step is required to enable the menu with all available settings. Or copy the XML file from BIN folder to WITCHER3_INSTALL_DIR\bin\config\r4game\user_config_matrix\pc. 3. This mod changes 16 standard script files, some being also modified by many other mods, so you must use Script Merger tool to detect and solve the conflicts with other mods. Don't install this mod if you're not using Script Merger (except if this is the only mod you're using)! Even if the game compiles the scripts without errors it doesn't mean that there are no conflicts and the mod will function properly. The mod supports two methods for using the new quick slots for consumables: you can bind 4 new keys (one for each new slot) or you can reuse the same keys that are also used for the standard quick slots. See the KEY_BINDINGS.txt file included in downloaded archive for details about how to bind new keys for the new quick slots. By default the same keys used for the standard quick slots are also used for the new quick slots (R, F, T and Y if you didn't change them): quick pressing a key will use the consumable from the standard quick slot, while holding the key pressed for a short interval will use the consumable from the new quick slot. The active set can be changed using the MOUSE WHEEL. In inventory menu the mouse cursor must be over consumable or bomb slots, while in Quick Access menu a sign or bomb slot must be selected, because for pocket and crossbow slots the mouse wheel is already used to change the equipped item or bolt. You can also assign another key for this, like left shift, left control or a mouse button. Use the RIGHT MOUSE BUTTON while inside Quick Access menu to open the Quick Inventory menu. In inventory and Quick Access menus use the Left Trigger (L2) button to change the active set. 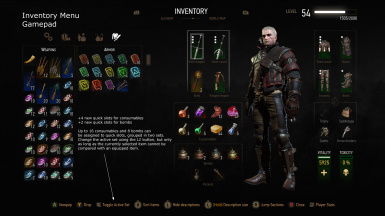 In Inventory menu it works as long as the currently selected item cannot be compared with an equipped item (because the L2 button will show the comparison tooltip otherwise). In Quick Access menu the button always works because is not used for something else. The big difference than vanilla game is that all the quick slots for consumables are visible on HUD when the Quick Access menu is opened. You can select a quick slot using d-pad buttons. Press Y button to drink / eat the consumable assigned to selected quick slot. 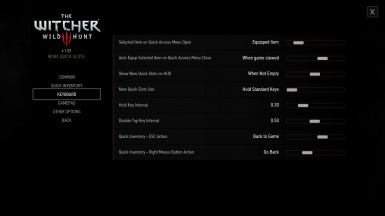 Use Right Bumper button (R1) while inside Quick Access menu to open the Quick Inventory menu. Open the wmkQuickSlotsConfig.ws script file with a text editor (like Notepad, Notepad++, EditPlus etc...) for a description of all available settings. Note that the file is used only for the initial configuration and any changes made here will be ignored if you installed mod's menu. 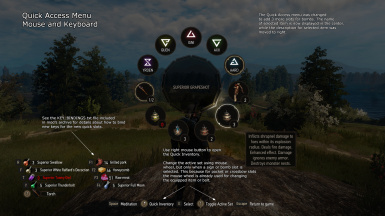 This mod changes the hud.redswf, hud_radialmenu.redswf, hud_iteminfo.redswf, hud_watermark.redswf and panel_inventory.redswf files. It is INCOMPATIBLE with any other mod that changes these files, except Corrected Sorting by Groznui, Sort Everything by DJ_Kovrik and Action Log mods. See their description for more details. All the resources used to create this mod are included in the blob0.bundle file. Also there's a README.txt file with all the changes I've made to the flash files, but this is mainly for me, to know what to do if the mod must be updated (it contains all the changes, but not all the details). Use the QuickBMS tool by Luigi Auriemma to extract the files. Other tools: Sarcen's Mod Editor, JPEXS Free Flash Decompiler (versions 7.1.2 and 8.0.1), Mod Kit and w3strings encoder. If you want to create a compatible mod that changes same REDSWF files then you must start with the GFX file included into bundle file. Don't extract the SWF from REDSWF using Mod Editor because the resulted file may be corrupted. The GFX files can be edited using JPEXS without problems. 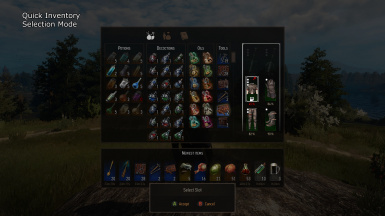 The idea to have two sets with consumables that can be assigned to quick slots: Potions Please mod by Zur13. You may also like Action Log and All Quest Objectives on Map mods.